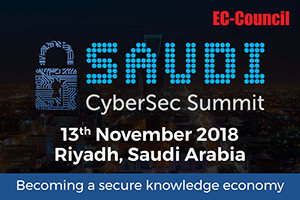 EC Council’s Kingdom CyberSec Summit scheduled for the 13th November brings to you the best in the industry from the Middle East and globally to discuss the burning issues in cyber security. Some of the concerns you can expect to find answers to are cyber security in the digital age, IoT in Oil & Gas, skill upgradation to create new jobs, compliance, ransomware, malware and cloud technologies. The summit is being hosted alongside our best skills development programs, namely Certified Chief Information Security Officer and Certified Ethical Hacker between 7th – 11th October 2018 in Riyadh, Saudi Arabia. 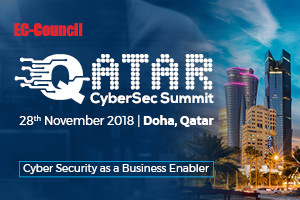 EC Council’s Qatar CyberSec Summit scheduled for 28th November brings the senior most information security professionals under one roof from government, international institutions, businesses, academia and globally renowned experts under one roof. These experts will discuss and debate the burning issues in cyber security to raise awareness and leverage best practices to combat the impending threats in cyber space. The summit is being hosted alongside our best skills development programs, namely Certified Chief Information Security Officer and Certified Ethical Hacker between 25 – 28 November 2018 in Doha, Qatar.